Kleider für Skulpturen in Kloster Wienhausen, Regensburg 2013. One of the possible afterlives of a medieval manuscript, if it did not end up as part of the bindings of a new book, or as lighter paper for a fire, was to end up recycled in the lining of a dress, as a recent post to the Bodleian Library’s Conveyor notes. 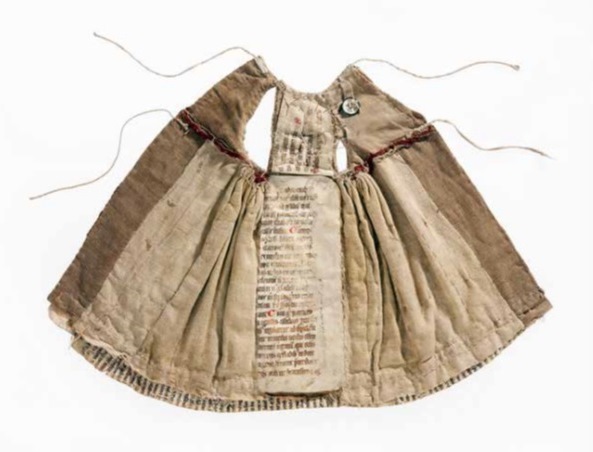 These parchment-dresses present themselves to us as objects from the past requiring explanation (though the explanations are sometimes more prosaic than we would hope). They also lend themselves to theorisation about the relationship between the categories ‘material’ and ‘textual’, as words detach from their original function and literally become material with which to clothe the body. A recent symposium organised by Sussex’s Centre for Early Modern and Medieval Studies on Modified Bodies and Prosthesis in Medieval and Early Modern England suggested that clothes—most strikingly early modern dresses shaped by stays and corsets—are bodily prostheses (Jenny Tiramani); but so too is clothing inscribed with words, such as parchment charms worn on the body (Margaret Healy). Words, like clothes, can shape and supplement bodies and selves. The medieval and early modern phenomena of textual clothing and material texts, however, are not left to us entirely without comment, nor entirely without theorisation in their own age. That is to say, people then, as now, made parchment-dresses do intellectual work. There’s a medieval tale of a Parisian scholar who appeared after death to his former master, ‘clad all in parchment written, with small letters written thereon’.1 Unsurprisingly, the dead scholar’s appearance raises questions for the master, one of which concerns the significance of the parchment-dress, and the words written on it: ‘what meant that garment that was so light, & the letters that was written thereupon’. If these things require explanation, the master’s question assumes that at least one thing about this strange scene can be taken for granted: that the garment is ‘light’. He thinks he knows, from experience, the feel and weight of parchment. Logical deduction, however, is precisely what this tale is going to confound. The scholar explains that, in fact, each of the letters written on the parchment ‘are heavier unto me than were the weight of this great church’. 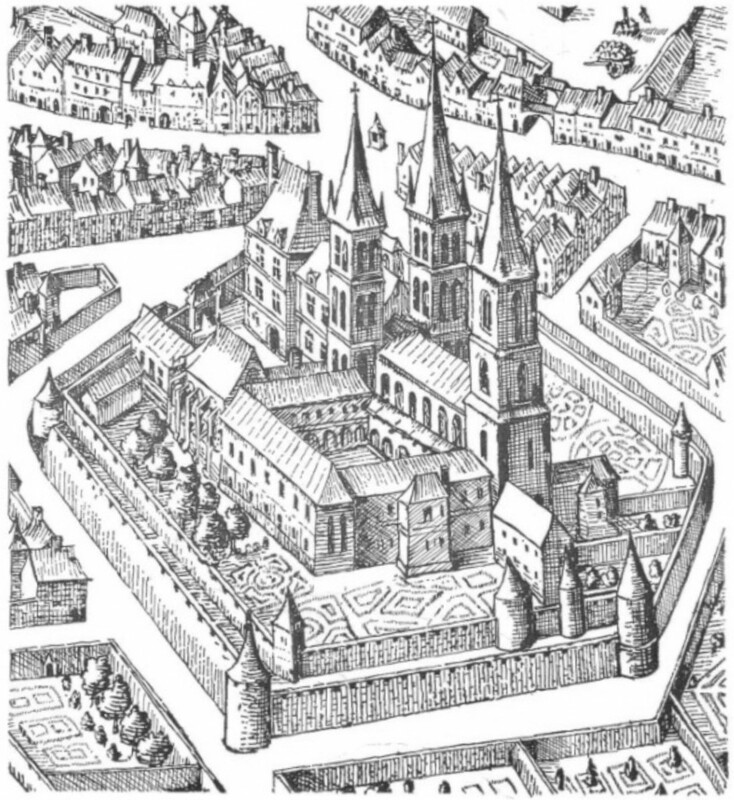 ‘Saynt German’ (the Benedictine Abbey of Saint-Germain-de-Prés) in Paris. The church in question is ‘Saynt German’ (the Benedictine Abbey of Saint-Germain-de-Prés) in Paris. The weight of this vast and lofty edifice is the measure of the words of ‘sophisms & subtelties’ with which the scholar had occupied his time in life. So heavy, and so hot, is this dress that the scholar cannot describe, only demonstrate what it is like: he asks his master to put out his hand, onto which falls a drop—of sweat? a word?— which is so hot (or so heavy) that it makes a hole in it. Bearing the hole in his hand for the rest of his life, the master subsequently leaves off logic and becomes a monk. 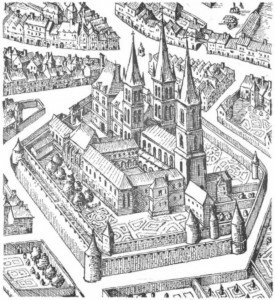 How much does a medieval cathedral weigh? How many letters are on the parchment-dress? What’s the sum of each letter multiplied by the weight of the cathedral of Saint-Germain? Scholastic wisdom holds ‘sophisms’ (questions used in disputation for logic) and ‘subtelties’ (an extreme refinement of argument) to be, by definition, light: The Middle English Dictionary defines ‘sotilte’, for example, as ‘thinness, slenderness, smallness’. But the scholar’s experience after death shows them to weigh heavy indeed: a single letter is like to the stone and timber and lead of a great gothic structure. Salisbury Cathedral, for instance, was built of seventy thousand tons of stone and over three thousand tons of timber for the roof, which was covered with four hundred and fifty tons of lead. You can do the maths. In medieval thought, words—even subtle ones—are always material, as another medieval tale found in the same collection shows: if due care is not taken in letting blood, words, along with blood, might accidentally be emptied from the body (See pp. 336-37). What the tale of the Parisian scholar also suggests is that words—spoken or inscribed on parchment—shape and alter the self. In some ways, then, this exemplary tale literalises the medieval understanding that words are material, exerting influence on material forms as well as immaterial selves, accruing and accreting to supplement the body and the way in which it signifies. 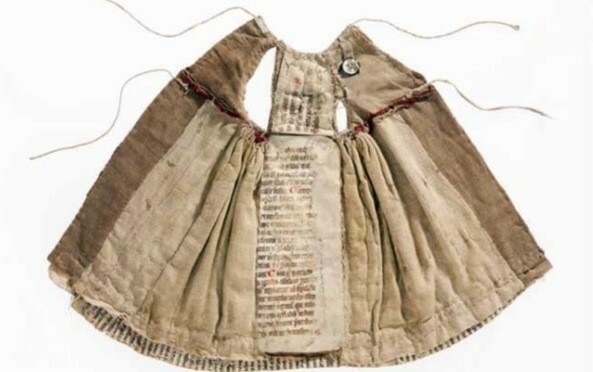 The form in which the tale of the parchment-dress survives, however, in turn materialises what is increasingly understood to be the always already prosthetic relationship between books and bodies. The tale ends by relating that the master ‘became a good man; & as long as he lived there was a hole through his hand. Et c.’ There are more words, then, but these are not recorded on the page, and so they are (to us) absent, immaterial, unweighable. Of eight hundred tales, one hundred and fifty end with Et c. Elsewhere Et c follows a rubric, or occurs mid-sentence—for example: ‘And thus because he trespassed in flesh & would not eat flesh when his abbot bade them therefore he was punished in flesh-eating, et c, for his inobediance’ (p. 452). The Et c suggests—what? That the reader can supply the Et c? That there is a generic way of carrying on reading that means the words don’t need to be given in full? Several times ‘ad libitum’ follows the ‘et c’: that is, ‘according to pleasure’. As you please. Whatever you like. However we explain it, the Et c here points out that the relationship between material book and embodied reader is always a prosthetic one, imagination or memory or desire bridging the animate and inanimate, the human and the object. Like the parchment-dress, Et c merely literalizes this relationship and makes the injunction to supplement, to fill in gaps explicit. By the same turn, it also leaves quantifying and qualifying out of reach. The weight of words, the multiple ways in which we wear the books we read, must always, finally, elude us. 1An Alphabet of Tales: An English Fifteenth Century Translation of the Alphabetum Narrationum, ed. Mary Macleod Banks, 2 vols. EETS o.s. 126-27 (London: Kegan Paul, Trench, Trübner, 1904-05), pp. 104-05. I have modernised the orthography. Previous Post100 Dubliners: A Small DisplayNext PostOh, those Ruffians!